A pretty good action flick that looks great, has well-choreographed action scenes, and even has a decent story. 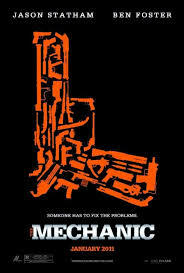 I haven’t seen the Statham movie, The Killer Elite, yet, which costars Robert Deniro and Clive Owen, but something tells me The Mechanic is the best of the bunch. it’s not only a fun movie with cool action, but it also has a fairly interesting story. in most of these movies, it’s paint by the numbers kind of stuff that you’ve seen a hundred times before. the bad guy is always the bad guy from the beginning, or else if it is going to be some other twist, then it’s a twist at the very end, just for the sake of having a twist. this movie actually throws twists into the middle. The film starts out generic enough, with a James bond like opening action sequence where Statham takes out a target that has nothing to do with anything. this character he kills or situation does not factor into the movie in any way, other than to show us a little bit about who this guy is and what he does. so it starts off kind of lousy. thankfully it gets a whole lot better after that. Statham’s character, bishop, is friends with an older man. that man, harry (Donald Sutherland), is bishop’s boss and mentor. harry negotiates the targets from high paying business associates and bishop takes the targets out. both Sutherland and Statham were in the movie the Italian job together, (also a remake of an older movie), and in that movie, Sutherland played a mentor figure as well. also in both movies, the Sutherland character dies early on and the rest of the movie becomes about the main character trying to avenge Sutherland’s death. that’s another reason why I thought this movie might just be the same old run of the mill thing. if it was simply a revenge picture it would have little to offer. but there’s something big that sets this movie apart from those others. I suppose it qualifies as a spoiler, even thought it happens early on, so you might want to stop reading now if you haven’t seen the movie. bishop is the one who kills harry. it’s a great scene too, with bishop speaking to harry over the phone, guiding him out of the building and into the garage, where bishop is there waiting. he tricks harry into getting away from his own security system, and then he kills him. it seems that harry was up to some bad things and so his boss (Tony Goldwyn), told Bishop all about it and asked bishop to take the job. and bishop did. now hurry’s gone and his son is left behind with no direction or idea what to do with himself. Ben Foster, an actor who really has come a long way over the past few years, plays that son, Steve. my favorite Ben Foster role is absolutely his twisted turn in Alpha Dog, but he’s been enjoyable and creative in other things too, such as his memorable role in the 3:10 to Yuma remake. the movie is now about these two guys working together, taking out targets. bishop trains Steve and puts him through the ringer a little bit to get the guy focused. and then he gives Steve a target. it’s a big guy who has a thing for younger boys. and Steve is going to pose as one of those young men. but what is supposed to be a simple slip of a drug becomes a major attack scene with tons of broken bones and furniture, as Steve attacks the guy in his bedroom. it reminds me a little bit of the scene in the John Travolta punisher movie where the punisher went up against a guy three times his nice, in his home. the scene is graphic and brutal, but it’s also a lot of fun. and that really starts off the cool action that this movie has to offer. there are many other great scenes that follow. one of them involves the guys hiding in the walls of a building behind panels. and when things don’t go their way, they end up in a rooftop shootout that turns into a die hard like bungee jump off the side of the building. it all looks pretty fantastic. the action in this movie is really what makes it. I always say that there are only two genres that don’t need to have a great plot. action movies and comedies. if a comedy is funny enough, than the storyline doesn’t really matter. the same goes for great action. all of those great Jet Li movies, that I used to love, for example, didn’t really have the best stories in the world. but the stunts were just tremendous and breathtaking. the mechanic might not have action on that level, but the action is definitely pretty good. and the fact that it has a pretty good story is really just bonus. I’m pretty sure that the reason why this movie rises so high above the usual Jason Statham film is because of the director. unlike those other movies which get lousy directors with little to no talent or experience, Simon directed this one west. he’s the guy who brought us con air and the general’s daughter. granted those two movies were over a decade ago (1997 and then 1999), but west still has talent, even if he doesn’t find the opportunities to show it off very often. I didn’t really care for his recent film, The Expendables 2, but with the mechanic, he finally shows us that he’s still got what it takes. This is not a great movie or anything, but it’s probably the best Jason Statham movie you’re gonna see. I think it helps that the film doesn’t hold back on blood and makes the action as violent as it wants to.